In the run-up to the election, this newspaper twice tipped South Belfast as a statistic to watch. The field was so divided that it seemed entirely possible that the winning candidate would be elected on the lowest ever share of the vote by a successful MP anywhere in the UK. Alasdair McDonnell won re-election to Westminster despite more than 75 per cent of the constituency voting against him. His 24.5 per cent share of the vote smashed the record for lowest ever winning proportion, held by Russell Johnston who won Inverness, Nairn and Lochaber in 1992 for the Liberal Democrats with 26.0 per cent of the vote. There had been until Thursday only six other MPs who had ever won election to the House of Commons on less than 30 per cent of the vote in their constituency. Dr McDonnell faced a battle on numerous fronts to hold on to the seat that he first won by surprise in 2005, and then held comfortably in 2010 when Sinn Fein stood down to ensure a nationalist victor amid the agreed unionist unity candidate in Fermanagh and South Tyrone. This time in South Belfast the DUP’s Jonathan Bell came a close second to Dr McDonnell, trailing the incumbent by a mere 900 votes despite the presence of another unionist in the field, Rodney McCune for the Ulster Unionists. Mr McCune’s total vote of 3,549 will have been a major disappointment for the party in a constituency that it long held in the 1970s, 80s and 90s. A former member of the UUP Bob Stoker split the competition for unionist votes by entering the contest for Ukip. The former lord mayor almost kept his deposit with 1,900 votes, which was just under the five per cent threshold. Another former Ulster Unionist was in the line-up: Paula Bradshaw. Standing for Alliance this time, she defied expectations by outpolling even the popular local MLA Anna Lo, with 6,711 votes to Ms Lo’s 5,114 in 2010. Ms Bradshaw, who is known locally for her work in the Village area, may have been helped by the fact that she stood last time, then under the Conservative-UUP banner. Mr Stoker was not the only former mayor in the race: Máirtín Ó Muilleoir got a strong vote of 5,402 votes for Sinn Fein. 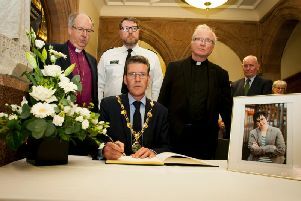 His reputation as a moderate voice within the republican party may have played well among the Catholic middle-class population, which has grown relentlessly in South Belfast over recent decades. A number of candidates for smaller parties polled respectably, most notably Clare Bailey for the Greens, who picked up 2,238. She built upon the party’s strong vote in a number of contests in the area in recent elections. Ben Manton of the Conservatives got 582 votes, while Lily Kerr of the Workers Party got 361 votes. While these two candidates got the smallest votes in South Belfast, pundits would not have been surprised if they had been squeezed further, given the variety of choice in the field. In his acceptance speech, Dr McDonnell warned that other parties must think carefully about who they back as a government is established. He said the next Parliament would have a significant impact on everyone in Northern Ireland. “The SDLP remains committed to opposing the Tory agenda and ensuring that we get the best possible deal for Northern Ireland. The SDLP is a sister party of the Labour Party but Mr McDonnell has said it would make its own mind up and has called for a “prosperity process” to support the peace process. The DUP and UUP were unable to agree a pact for the constituency. DUP junior minister Jonathan Bell said in his concession speech he had come within a whisker of making South Belfast a unionist stronghold.